New Etsy Shop Just For Applique and Embroidery Licenses for Digitizing + Free Line art for digitzing! I am excited to now start offering some of my new digital stamps as applique/embroidery art licenses! I created a new Etsy Shop called 2CuteinkAppliqueArt where they will be listed. I also will be creating some art just for applique too, or even alternating a digital stamp to make it work better for applique! 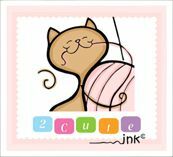 If you are a digitizer sign up for the 2 Cute Ink Applique Art Newsletter to get Freebies and coupons and find out when new art is available! Below is this month's Freebie "Little Pumpkin (which is a modified version of my free digital stamp Pumpkin Cookie) Grab it by 9/4!